US Secretary of State John Kerry has arrived in Egypt, as major protests take place in several cities. Police used tear gas against protesters in the city of Mansoura. At least one person was killed and dozens injured in the violence. The protester was killed after being run over by a police car which was dispersing the crowd. The accident sparked more anger, leading to further clashes with police. 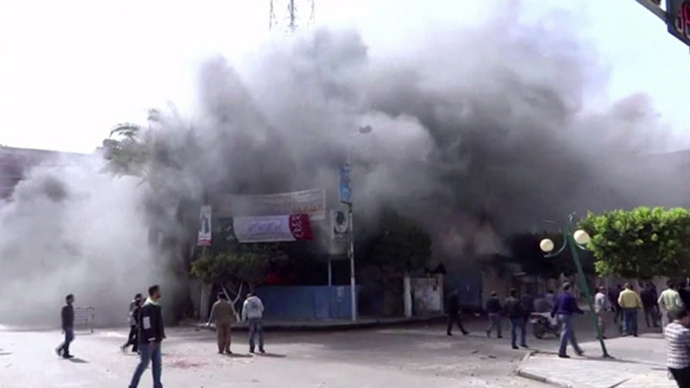 A conflicting report from the Egyptian Popular Current said that four people were killed in the Mansoura clashes. That report was not confirmed. Dozens of people were injured during the violence, which began when police fired tear gas at protesters, Ahram Online reported. Video footage from ONTV showed officers dragging and beating up a man captured during the demonstrations. The situation in the city remains tense, and police units have been deployed to the area. Earlier on Saturday, around 500 protesters threw stones and petrol bombs at a police station in Port Said, setting it on fire. The interior ministry says protesters then blocked fire engines from reaching the blaze. Five protesters were hit by a police car while blocking traffic, according to AP. Human Rights Watch spoke out against police violence in Port Said on Saturday, saying Morsi should "publicly acknowledge that the police's right to use lethal force is not unlimited — even when they come under attack — and order the police to limit any use of force to what is strictly necessary." "Neither the Interior Ministry nor the president has admitted any wrongdoing on the part of the police in Port Said," the statement said. More than 70 people have been killed in clashes with police since the second anniversary of Egypt's uprising in late January. Saturday's protests come as US Secretary of State John Kerry arrived in Egypt on an official visit. Kerry met with opposition leaders during the day, and is set to meet with Mr. Morsi on Sunday. In a round-table discussion, Kerry told opposition figures that Egypt needs to pass necessary reforms to qualify for a $4.8 billion IMF loan package. Steps could include increasing taxes and curbing energy subsidies. “It is clear to us that the IMF arrangement needs to be reached,” Kerry said. Agreeing with the IMF would unlock financial assistance from the US, including Obama's $1 million pledge last April. Kerry also said that Egyptians need to come together to boost the confidence of businesses. “It is paramount, essential, urgent, that the Egyptian economy gets stronger, and gets back on its feet, and it’s very clear that there is a circle of connections in how that can happen," he said. “To attract capital, to bring money back here, to give business the confidence to move forward, there has to be sense of security, there has to be a sense of political and economic viability,” Kerry added. Kerry's visit has been rejected by Egyptian opposition leader Hamdeen Sabahi and his colleague, Mohamed El-Baradei. The two men turned down invitations to meet with Kerry in Cairo. “I received an invitation and turned it down, and Dr. ElBaradei received an invitation and he turned it down,” Sabahi said in an interview with a local television channel. “We want to send a message that we reject American pressure,” he added. Members of the opposition have accused America of siding with the Muslim Brotherhood, which they say is no different from the government of ousted leader Hosni Mubarak. The opposition says Washington is not critical enough of the Brotherhood's methods of imposing power, including introducing an Islamist-backed constitution despite and opposition boycott, the Lebanese Daily Star reported. Tensions are also running high due to the fact that the US has expressed discontent over the political divisions that are gripping the country. In particular, Washington is pushing the main opposition group, the National Salvation Front, to change its decision to boycott parliamentary elections set to start in April. US President Barack Obama told Morsi in a phone conversation last week that he welcomed the Egyptian leader's "commitment" to represent all Egyptians, but encouraged him to find common ground with the opposition. One opposition group, the National Association for Change, branded those comments as "blatant interference in Egypt's internal affairs." Morsi's administration says the opposition is attempting to use street violence to overturn the leader's election victories.